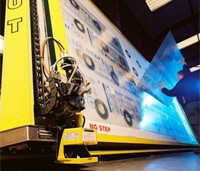 Our custom cnc cutting machine was designed specifically for cut-to-size multiwall polycarbonate sheet. We are able to provide complete customisation of product including servo drive systems. The cnc positioning machine was developed to meet customer requirements for automating one stage of their production line. Our special purpose machinery covers a wide range of products including platform survery machines and glazing bar punch units. We can custom develop any units for your factory automation machinery needs.